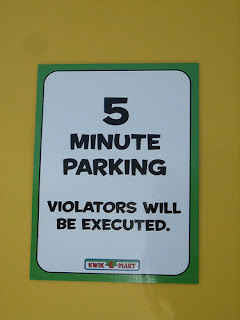 Awesome Kwik-E-Mart / Simpsons movie promotion with 'reverse product placement'! 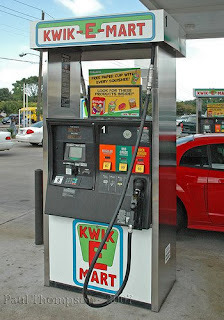 For the next month, twelve 7-Eleven stores at various locations in America have been turned into Kwik-E-Mart’s to promote the Simpsons movie (New York City, Chicago, Dallas, Burbank, Denver, Los Angeles, Henderson, Orlando, Mountain View, (California), Seattle and Bladensburg). 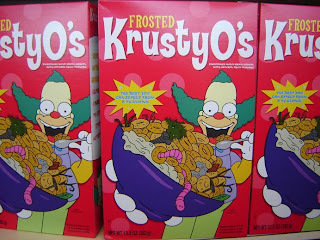 6000 other 7-Elevens will sell Simpsons branded products never before available outside of the TV show – including Buzz Cola, KrustyO’s cereal, Radioactive man comics and Squishees. The phrase ‘reverse product placement’ has been coined to describe this. Instead of putting products into a film or TV show, fictional goods from the screen become real life products. 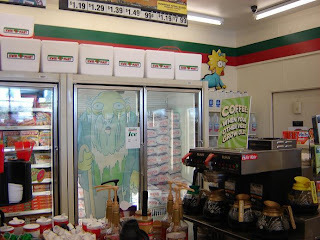 Whilst the Simpsons / 7-Eleven tie-up is not the first of it’s kind, it is definitely the most prominent. 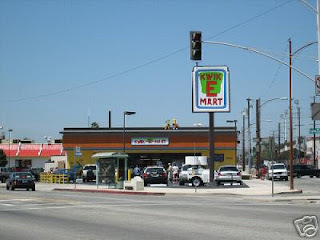 The Kwik-E-Mart stunt has created a lot of interest amongst online audiences. A number of blogs, chat forums and photo sites are showing off images of the stores (a selection of which I have pasted here - full selection from rdr07 on Flickr.) 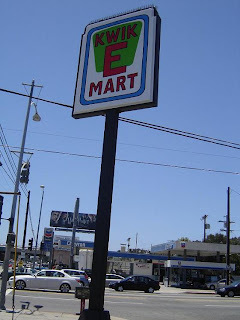 Kwik-E-Mart uniforms are even being sold on Ebay! 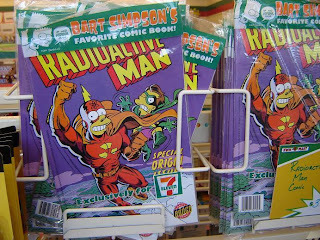 I think this is really clever and a great way of making the Simpson’s movie stand out from the summers other blockbuster releases.